This week marks the end of the fifth full year of this column. 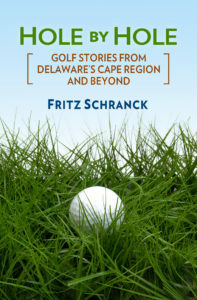 Cape Region golf went through a wide-ranging mix of changes and accomplishments. January— Micah Vugrinec, a senior at Cape Henlopen and a member of the school’s golf team, describes his upcoming enrollment in the selective Professional Golf Management (PGM) Program at Methodist College, in Fayetteville, North Carolina. Cape Region golf superintendents discuss the risks to golf courses from the excessively cold winter. February—Shawnee Country Club and Sussex Pines Country Club announce programs to bring in new members to the Cape Region club scene. Ron Barrows, dean of Cape Region golf professionals, describes his 36 years at Rehoboth Beach Country Club. March—Women members are welcome at Shawnee Country Club, but not at Augusta National. It’s up to the members at both places to decide. Butch Holtzclaw, the head golf professional at The Rookery Golf Club, gives a few tips about restarting one’s game after a long winter layover. The folks at Clubhouse Golf are the area’s leading marketers of hope, and describe this year’s new offerings. Cape Henlopen High School’s Viking golf team opens the 2003 season with a nice little 164-167 victory over Caesar Rodney. April—Dover High’s Senators whack Cape on Rehoboth Beach Country Club’s par-36 back nine, 161-177. The team bounces back with victories over Delmar, Indian River, Lake Forest, Seaford, and Milford. Former Cape standout J.J. Oakley comes home for a college tournament at Kings Creek CC, finishing in sixth place. Bald eagles and other wildlife don’t mind sharing their habitat with Cape Region golfers. May—Pinehurst, North Carolina is expanding its links opportunities for vacationing golfers. Cape’s golf team continues its winning pace, with victories over Smyrna, Laurel, Sussex Central, Sussex Tech. Polytech, and St. Thomas More. Tyler Witman highlights the regular season with a record-setting 29 at The Rookery during the Tech match, and wins his second state championship at Wilmington Country Club. Jerry Dorneman retires as Cape’s golf coach with a flourish. June—The annual Rehoboth Beach Junior Open continues its popularity with dozens of kids competing. Andrew Seagraves receives the top scholarship and plans to use it to attend the University of North Carolina. Steve Zeveney, superintendent at Shawnee CC, explains why the course’s Bermuda fairways love the hot weather. July—The PGA announces new rules about drivers on the Tour, including provisions similar to post-race NASCAR standards. The owners of Heritage Inn & Golf seek approval to change the course and add 146 new homes to their property. August—Lou Sturgis makes his first hole-in-one, after only 66 years of playing golf. Cyclonic golf, the Lewes shoe company, makes a marketing deal with Clubhouse Golf of Rehoboth. I discover that maybe I’m not so fit for my fitted golf clubs. Hump and John Schneider celebrate their fourth anniversary since opening Marsh Island Golf Club. Cape Region superintendents discuss pest control, including fly boxes. September—Rob Marshall of Old Landing Golf is a convert to cutting trees to restore turf health, because it works. Delaware Technical & Community College’s Turf Program continues to attract applicants, with good reason. October—Volunteers make the George Washington University Rehoboth Beach Invitational college golf tournament a success. Walt Jones and his family carry on the tradition of public golf at Midway Par 3. Cape grad Reinie Vugrinec makes golf history as a member of the first women’s team at Old Dominion University. Elderhostel participants love to learn golf in the Cape Region. November—My father demonstrates how to scramble for par. Fall golf reminds us that it’s a total lie that trees are 90% air. I describe some Christmas golf gifts to avoid. December—The annual golf book gift guide highlights the year’s top five books. Area golf clubs and merchants provide valuable shopping discounts and other enticements for other golf gifts.